Lightly sand the plywood, removing any rough edges. Spray the plywood with white spray paint and allow to dry. Add a second coat and let dry. Light sand if it feel rough to the touch. Cut denim and fabrics into different sized circles. Arrange circles on the plywood, layering different sizes of contrasting colors and patterns. Use some with three layers, others with two, and some just with one. Cut a tree trunk from a piece of denim. Cut the trunk into strips. Lay the strips of trunk on the plywood. Once you have everything arranged the way that you want it, use a paintbrush to lightly apply a coat of glue to the back of the denim. Be careful not to get glue on the front as it can discolor the denim, making it darker. Gently press and smooth the pieces in place. You can use wall putty to hang the wall art, or attach a picture hanger to the back. 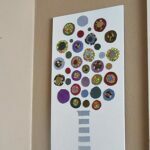 This project for Colored Denim Circle Tree was printed from CraftsbyAmanda.com - https://craftsbyamanda.com/colored-denim-circle-tree/ and can only be printed for education or personal use.